Mini Treat Bag For You! Another item using the mini treat bag thinlits dies. This time I made a card..at least that is what I am calling it. The outside I used two dies that are part of the set. Here you can see what is inside. I created an insert which I stamped and heat embossed then added some ribbon and I cut out the small bow to place over my staple. The bow is a die also from the set. 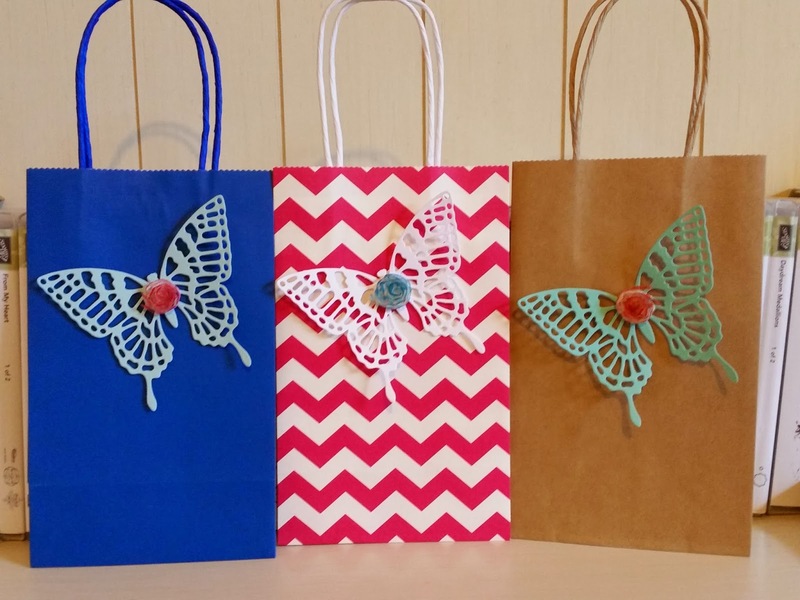 There are so many thing you could use to decorate these bags. I tried to stick with the items that came with the set to show the value of the set of dies. I hope you have a blessed last of January! Finally got around to playing with my mini treat bag thinlits dies! This is a basic bag I did with the Sweet Taffy DSP. I used three other dies in that thinlits set to decorate. 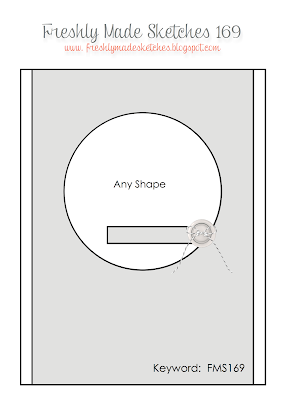 Come back for more examples with this die over next few days! 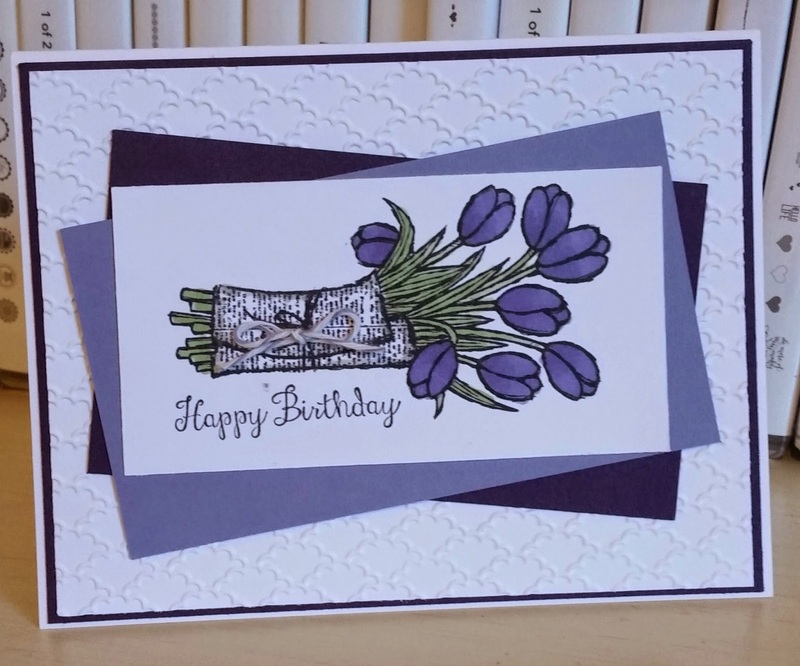 I designed this card for my Pals (my stamping group) swap. For this swap we had to make a full card and it was a birthday theme. 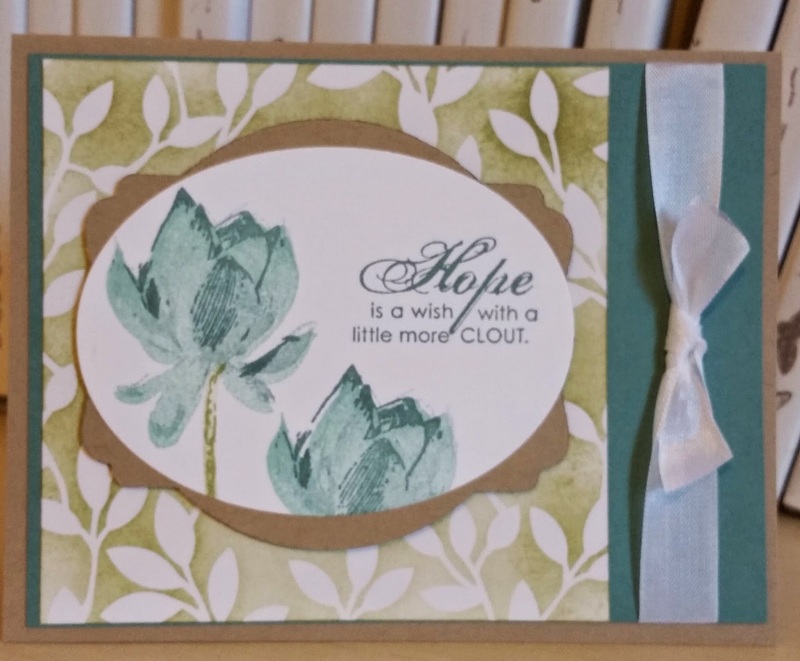 I masked the sentiment with these stamp and added a Happy Birthday from Bloom With Hope. I like the tulips on their side and of course, I love them in Purple! I did a lot of coloring/blending with my Wisteria Wonder and Wild Wasabi blendabilities markers over several nights! Oh Yeah...I made 25 of these cards! 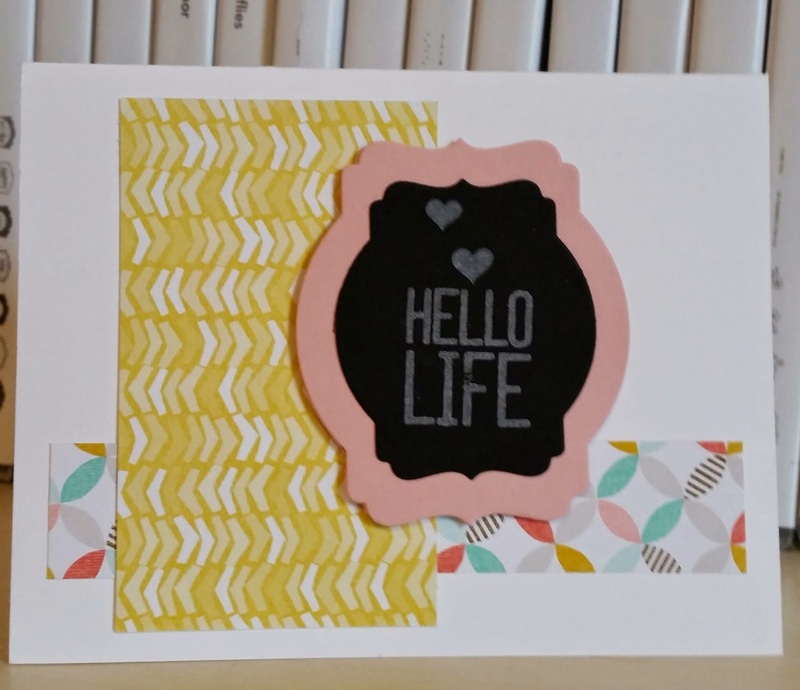 When trying to decided on a card to make for this I choose to go with one of my fav stamp sets (which happen to be a single stamp) in the new Occasions catalog and my fav colors and one of my fav emboss folders! The layout happen to be from a recent FMS sketch. I hope you have a Grand Thursday! I am my SU! leadership conference which happens to be here in Orlando where I live! Not far to go but several long days which I hope will be informative and fun! I like this simple sketch, especially since I did not have much time to design the card! 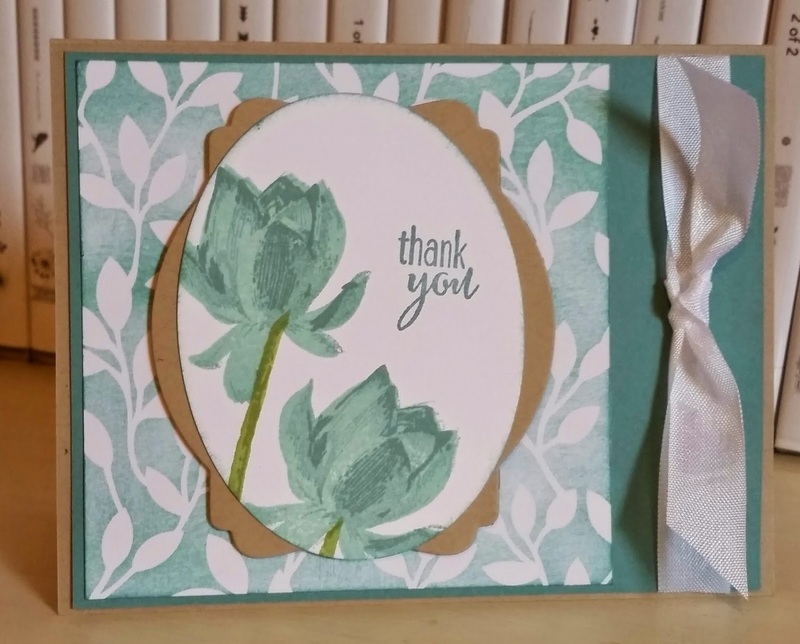 I already had stamped and punched the flower out for another project so decided to use it and the colors fell in place from it. The sentiment is stamped in Smoky Slate right on the DSP and looks light in photo but shows up better in person! I was playing with a layout and decided to use some more Stacked With Love DSP. I hope you have a great Tuesday and thanks for stopping by! Hello again...back for day three of swap card fronts? I made only a few of these also. I wanted to use some of the Best Year Ever DSP from the SAB catalog and decided to play around with coloring the sentiment. I ope you have a fabulous Monday and thanks for stopping by! 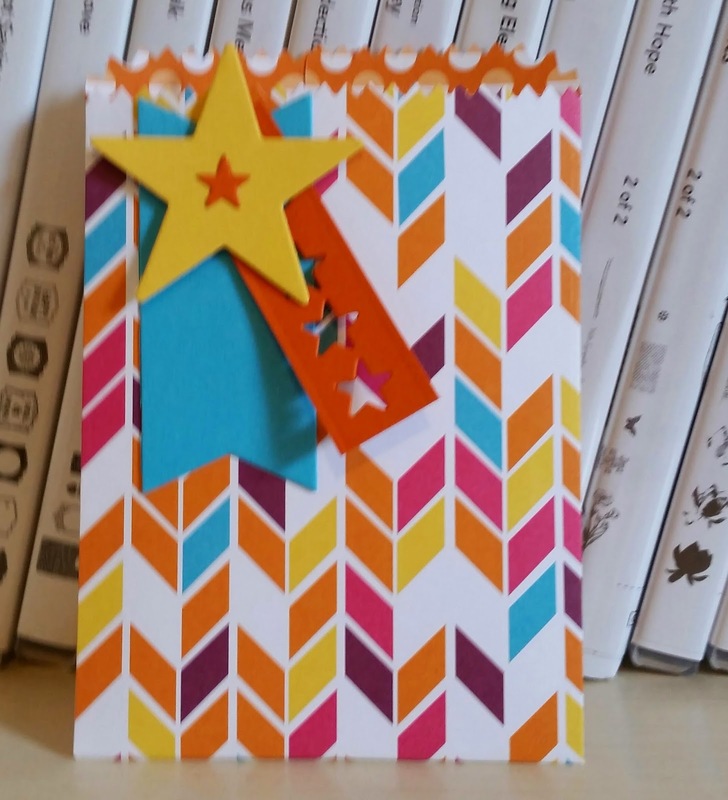 Quick and easy card to brighten someone's day! I made a few of these to take to the conference later this week. My goal is 50 swap card fronts and i am almost done! I have about 5 or 6 designs. Come back for day 3 tomorrow...see you then! Have a great Sunday and thanks for stopping by! I am making swaps (card fronts) for SU! leadership conference coming up this Thursday through Saturday! This is one sketch using the new Stacked with Love DSP . 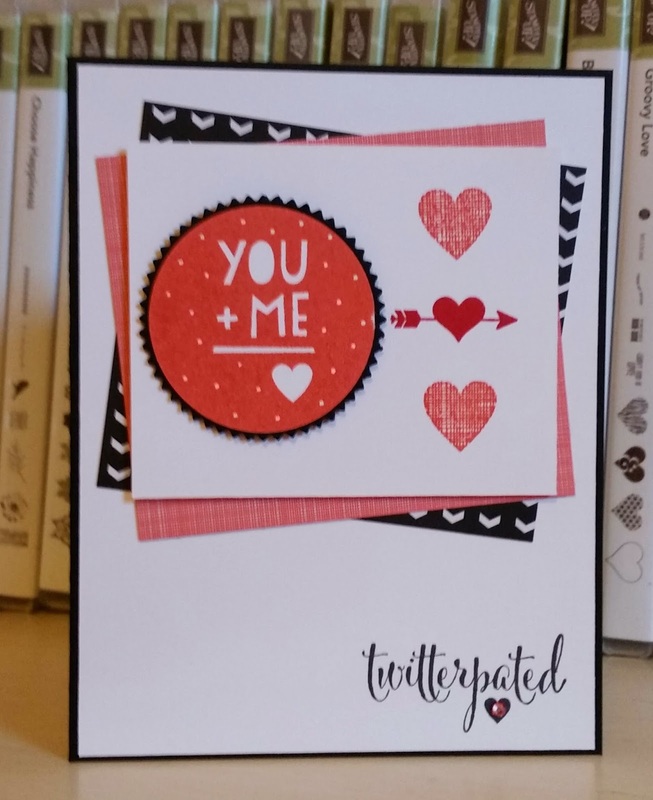 I did not want to make them Valentine cards but thought this sentiment would be something that could be sent to anyone to say Hello! I have these cut so ready to layer onto a black card base. I have more tomorrow so stop back by and Have a lovely Saturday! Just got this set and love that it matched several punches I already own! Bonus! Anyway, the light bulb and the sentiment are separate which I like and here I combined them together and then punched with the note tag punch. 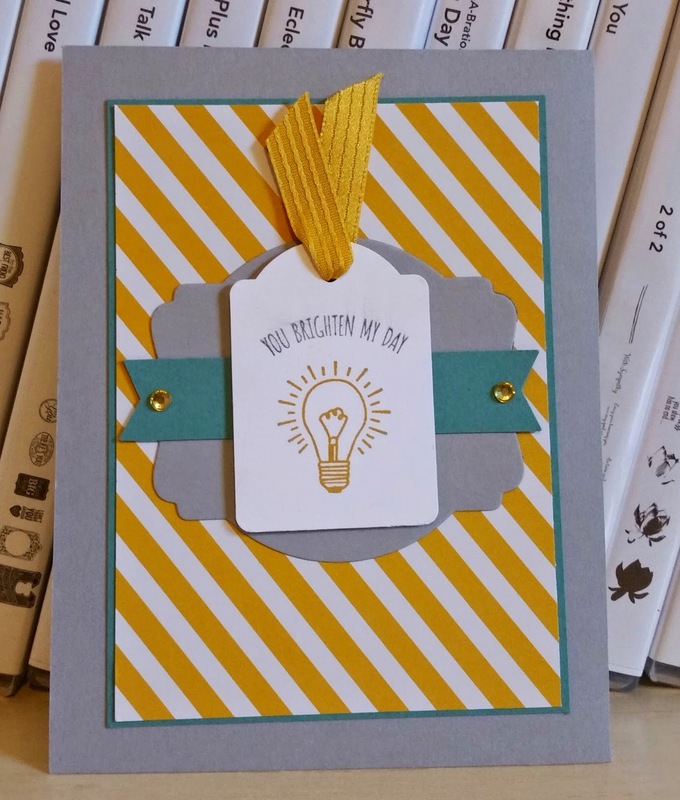 You can earn the stamp set called You Brighten My Day or the accessory pack I used the ribbon from called Best Year Ever free! For every $50.00 you spend in SU! 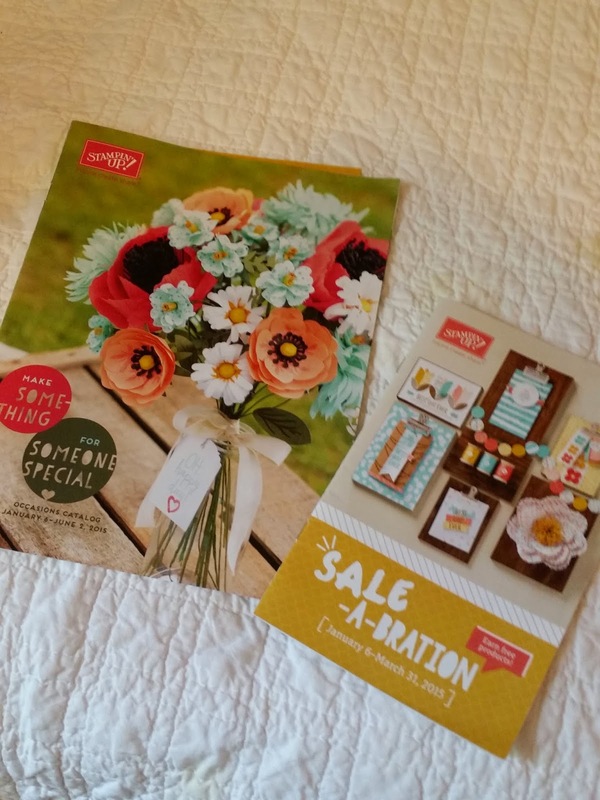 product, you can pick an item from the Sale-a-bration (SAB) catalog for free! I looked at my color coach and was not thinking Calypso Coral and Hello Honey went together but on there..they do! So I tried it and it works for a bright effect! Hope you can play along with the Freshly Made Sketch this week! As soon as I saw this sketch, I thought of turning it and using the feathers with matching dies! The colors came togther with the help of the Stacked With Love DSP paper stack. 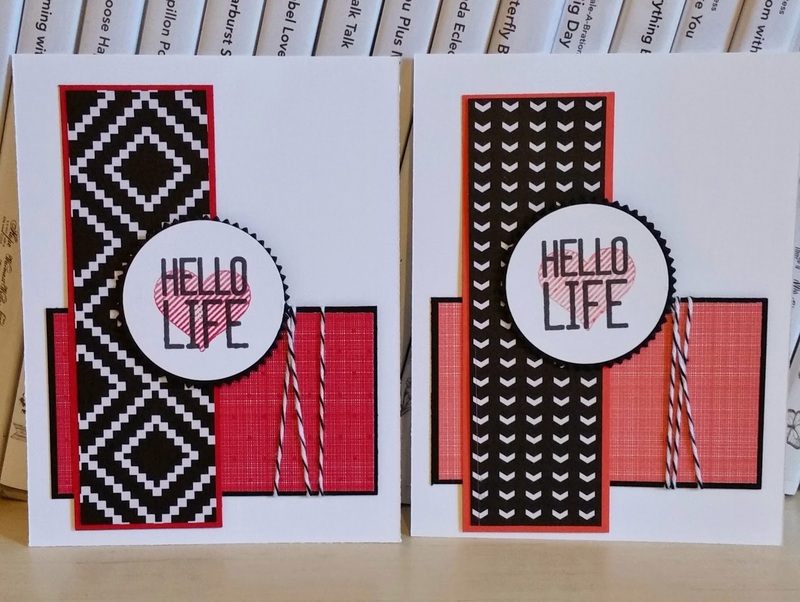 But I was not going for a Valentine feel so I choose Hello Life and will send to my college girl! I hope you have the best Thursday and thanks for stopping by! 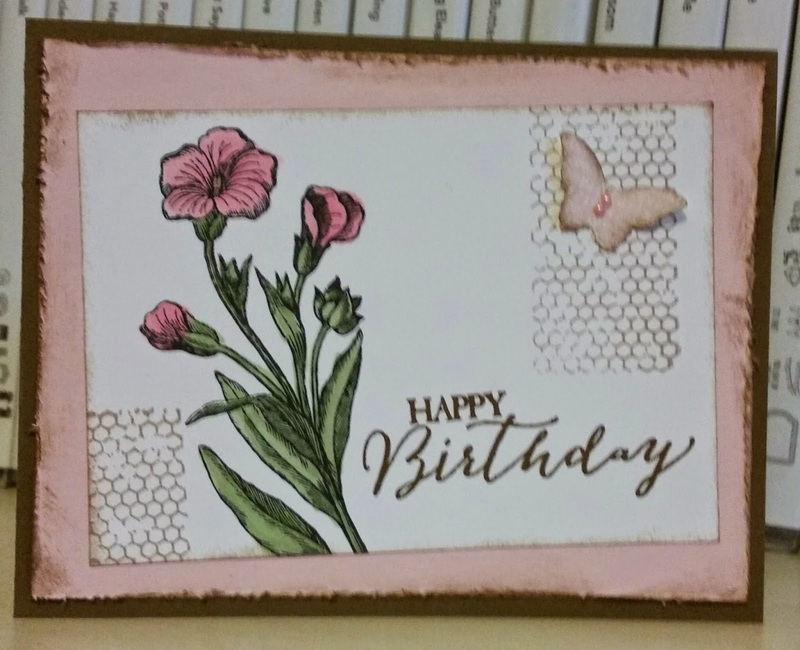 Using more pieces from my January card classes. This is a 4 1/4" square card I am putting in my thank you stash. I usually send several after my birthday which is coming up next month. I originally was placing the thank you banner over the linen thread but then thought "why not on the butterfly die" So went with it! I hope you have a fun Wednesday and thanks for stopping by! I had some pieces left over from my January card class and so decided to change up the original design but using same colors, stamp set and pieces cut. I tried not to make to too busy and keep it clean. I hope you have a blessed Tuesday and thanks for stopping by! 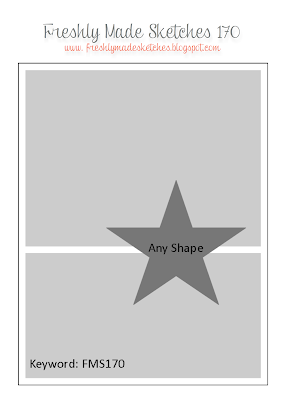 I designed this card for my next card classes in February (need to get ahead with my leadership conference coming up next week). 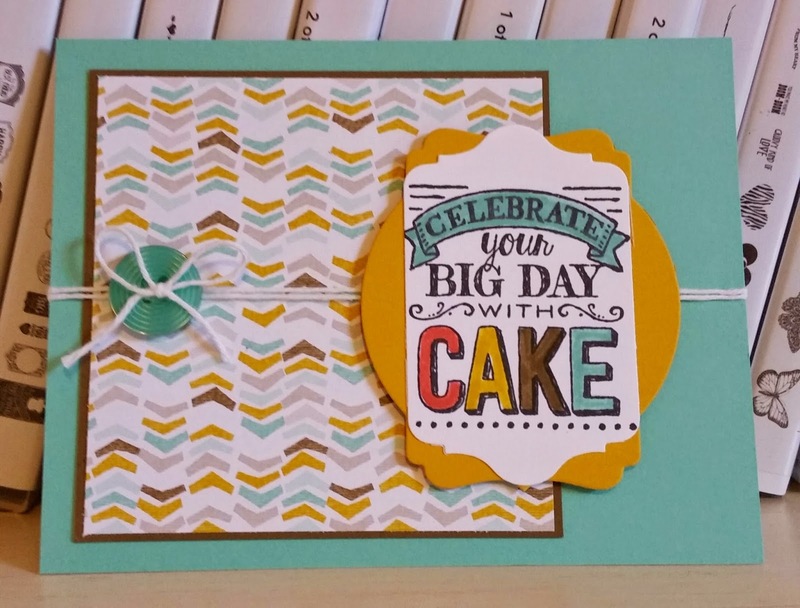 Just happens to go great with the Paper Players challenge..clean and simple with sentiment taking the center stage! 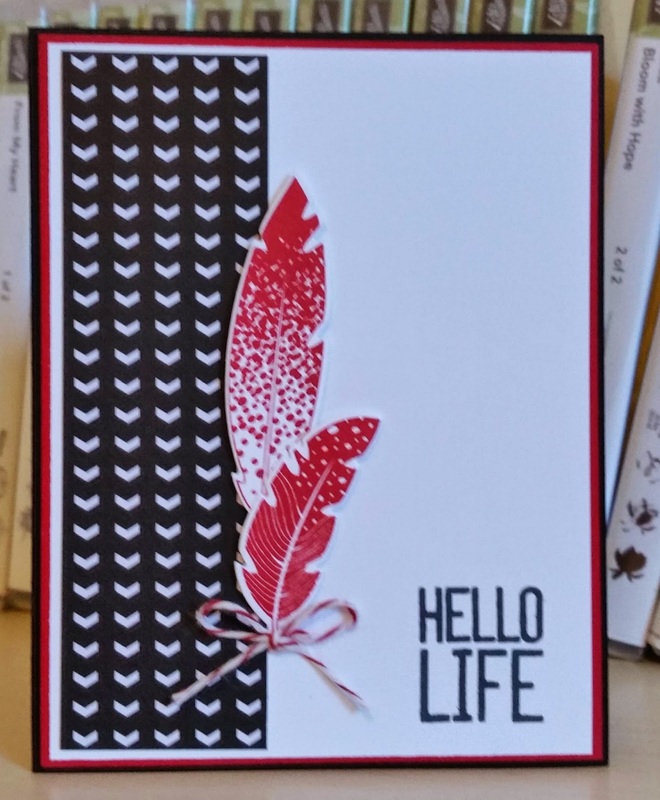 I embossed the sentiment from hello Life with Calypso Coral emboss powder. Thanks fellow Pal Debbie Crowley for the inspiration in my time of need! Have a wonderful Monday and thanks for stopping by! This is a little variation on another card I designed for my cared classes this past week. 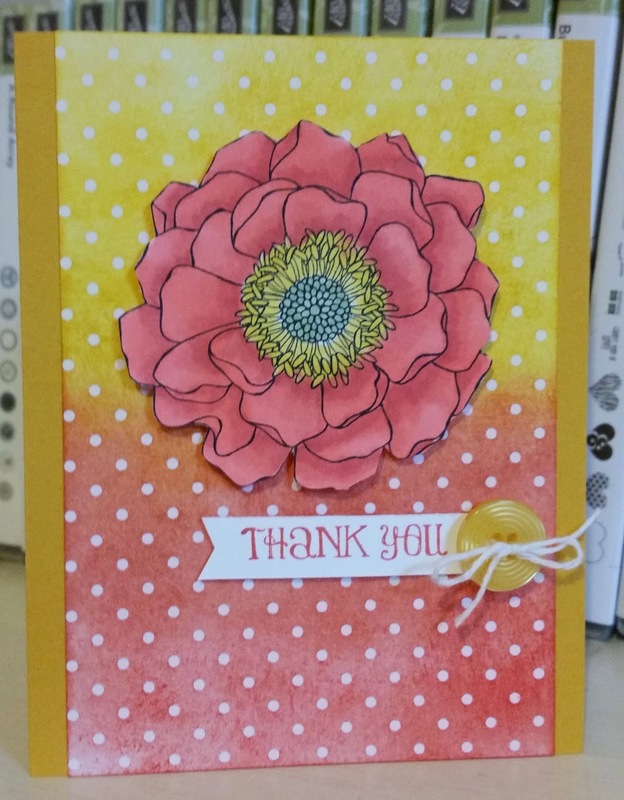 I turned the deco label and flowers and sponged on the Irresistibly Yours DSP in Pear Pizzazz. I really like Pool Party, Lost Lagoon and Pear Pizzazz together! Very fresh to me! I hope you have a lovely Sunday and a great start to your week! I felt like doing some blending today with the Calypso Coral, Daffodil Delight, and Wild Wasabi Blendabilities markers! I also used some of the Irresistibly Yours DSP you can earn for free during the SAB promotion with every $50.00 you spend. I colored it with ink and sponging trying to do some ombre effect but not really well. I did struggle with this sketch but when I finally laid out some paper and had a color combo it came together. 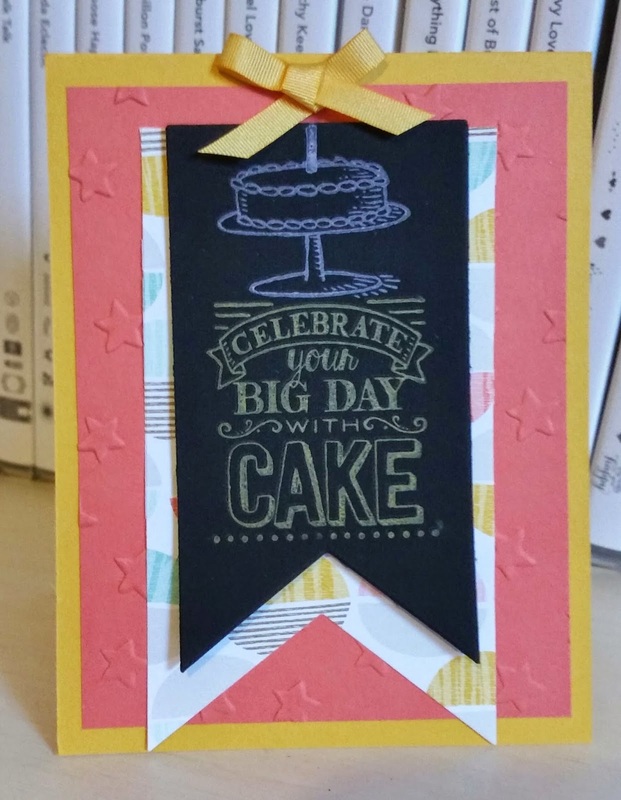 I used Big Day which is a stamp set you can earn free during the SAB (sale-a-bration) promotion. For every $50.00 you spend in SU! products either from the Annual catalog or the new Occasions catalog, you can pick an item for free. That is a free item for every $50.00. I hope you have a fab Friday and thanks for stopping by! 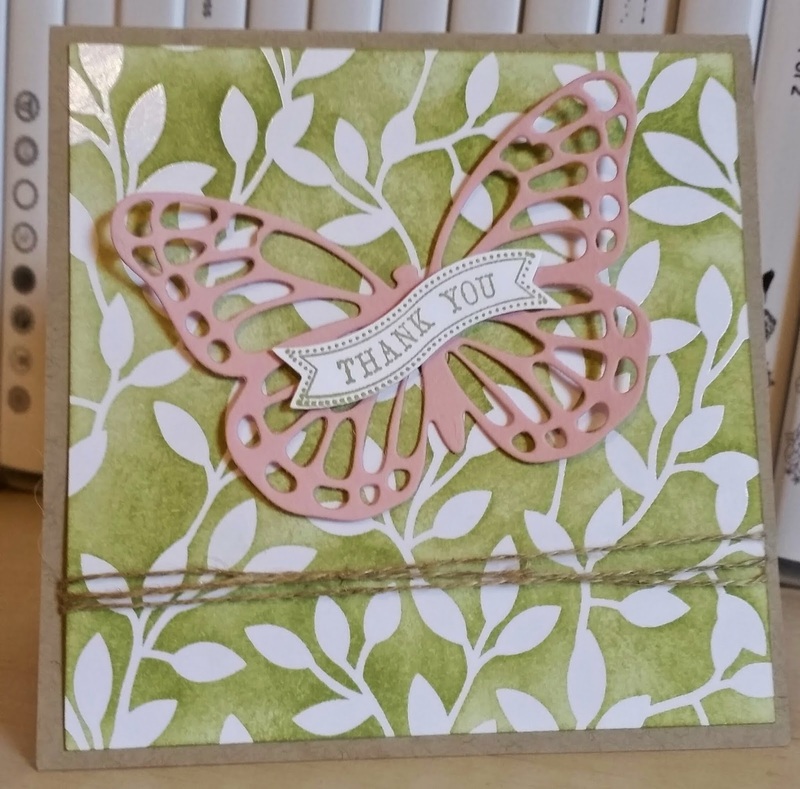 Love the sentiment from the Butterfly Basics set! But I decided to pull out one of my very fav sets called Kinda Eclectic. Love all the elements in that set. Of course, purples were used here! I sponged Perfect Plum on the honeycomb folder front and closed it down, rubbed it with my hand to transfer the impression. Have a great Thursday and thanks for stopping by! These are some the bags i decorated for card classes the past two nights! I wanted to show off the largest butterfly die for the Butterfly thinlits dies in the new 2015 Occasions catalog. I also sponged color onto some vintage flower trim to decorate the center of the butterflies! The guest took their cards home in the bags and can add a sentiment or some ribbon and reuse the bags with a gift! Hope you have a lovely Wednesday and thanks for stopping by! I decided to play around designing a one layer card. I guess this counts since butterfly is a die cut! 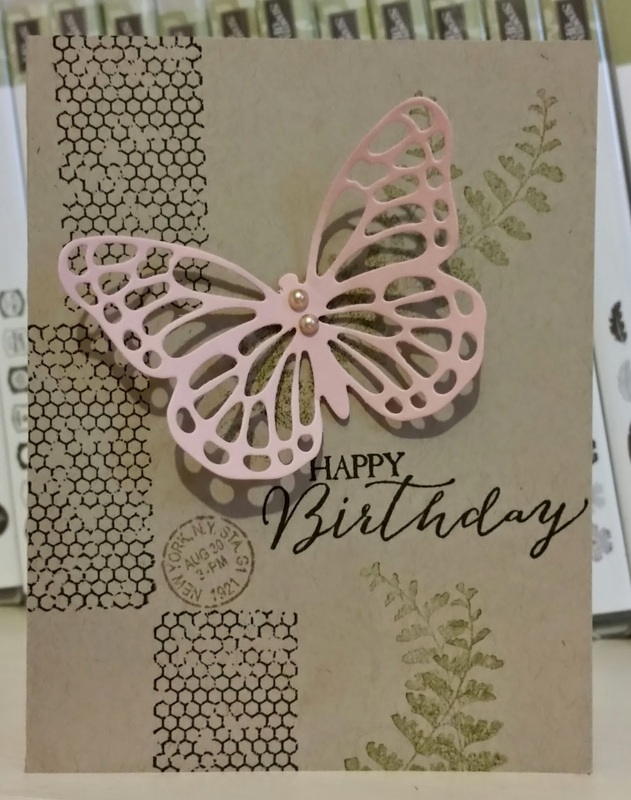 I had the extra butterfly cut out on my desk and decided to challenge myself to make a card with out adding any more layers and just the Butterfly Basics set! It is good to challenge yourself and do something you usually do not do or you cause yourself to get in a rut! I hope you have a fab Tuesday and thanks for stopping by! I started this color challenge by looking through my Moonlight designer series paper stack and see what print I could use in either Sahara Sand or Lost Lagoon. I decided to use these cool raindrops??? or whatever they are as the main background. I used a stamp from Oh My Goodies and inked it up in Calypso Coral and stamped it again in Lost Lagoon. 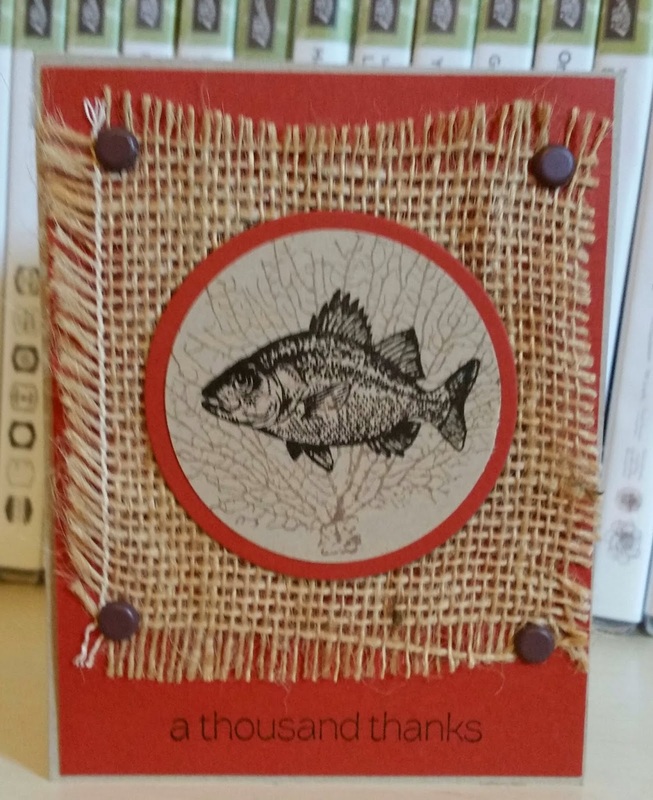 The Coral was cut with the Deco Label framelits dies and I hand cut the thanks from the Lost Lagoon image and layered it over with a dimensional. Easy and fast. Thanks for stopping by and have a awesome Monday! 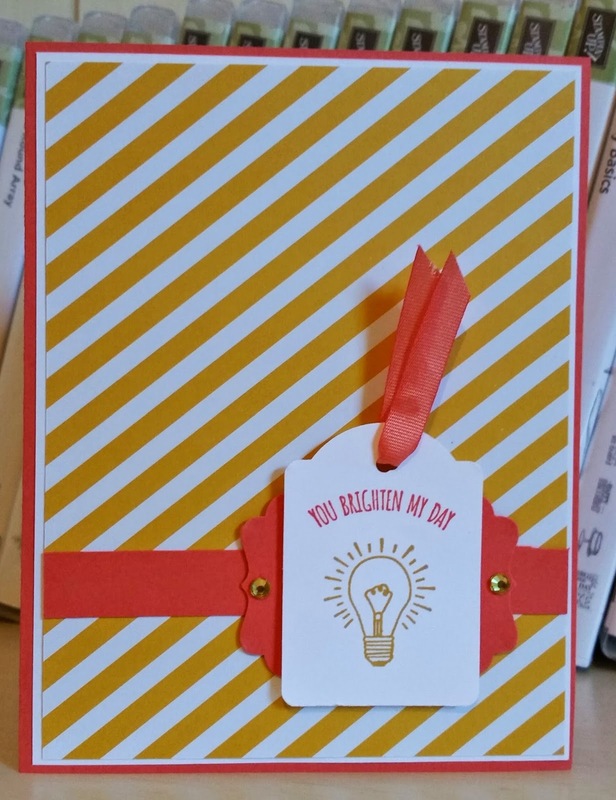 I made another simple clean card today for my daughter at college! Of course, it had to be my fav color-purple! Took me a few mins to make and has a wow effect with the butterfly. I can not say enough for these dies! So glad SU! decided to keep on trend! 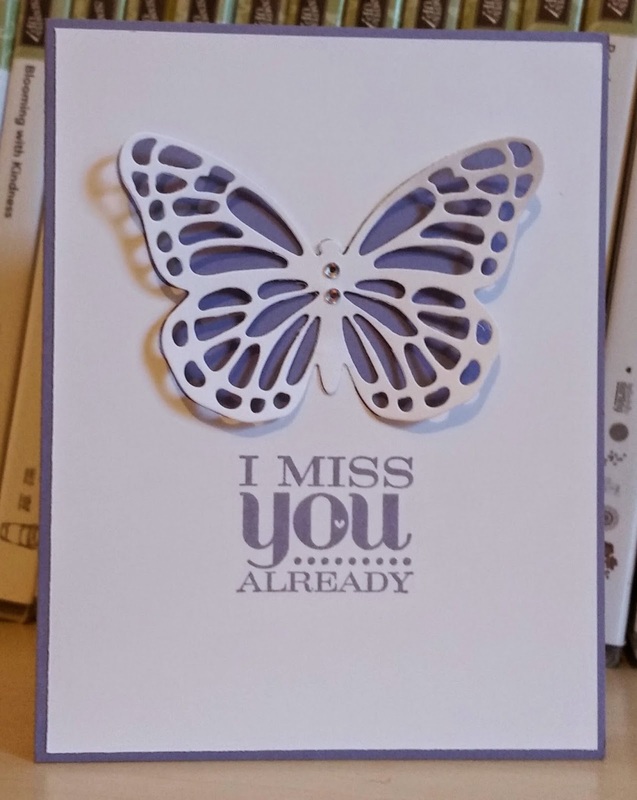 I cut the butterfly out of the Whisper White piece and then stamped my sentiment and then adhered to a card base of Wisteria Wonder. I then took the die cut butterfly and adhered it with two glue dots. A little bling in center finishes it off! Thanks for stopping by! Have a wonderful Sunday! 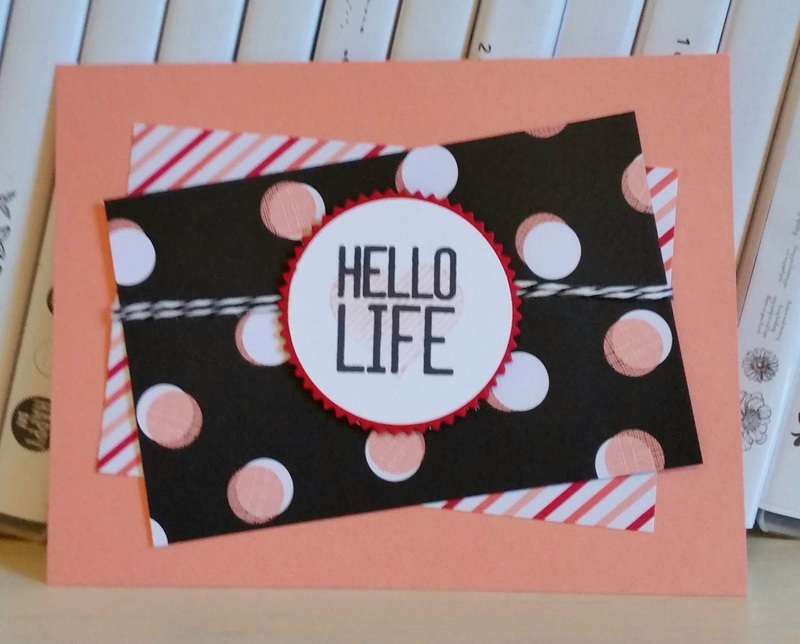 I made a quick and simple hello card for my mom. I mail her a card every Fri. or Sat. so she gets around Tuesday in Georgia. If not there by Thursday, she is on phone calling me! Anyway, I used a quick layout from Freshly Made Sketched before the holidays and added my sentiment on chalkboard paper with the chalk ink in Rose Coral. I hope you have a fab weekend and thanks for stopping by! 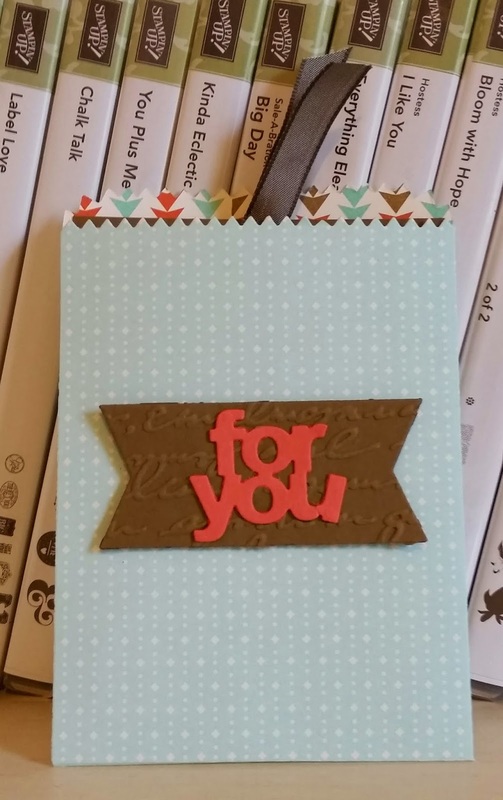 I really loved making this card...fun elements in the You Plus Me stamp set! Great addition to black/white/ red with the Crisp Cantaloupe and Calypso Coral mixed in the DSP! I hope you have a wonderful weekend and thanks for stopping by! I just love the new set Butterfly Basics and this butterfly is my favorite in the set because of the lace print. Loving that it also has a matching die to cut it out for me! When I saw the trio of blue, I immediately thought of the butterfly trio to rock these colors! 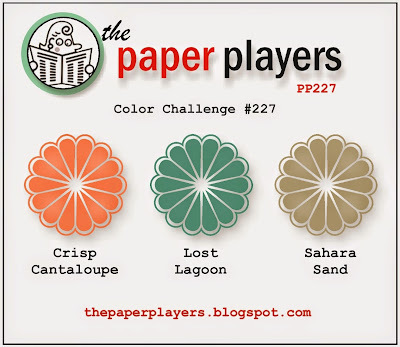 I hope you will play along on the color challenge this week! 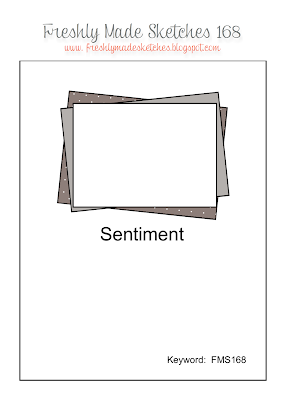 I needed some cards in my stash that I can use for any occasion, so I opted to not include a sentiment. I added some Pool Party sponged to the honeycomb embossed background to give some more depth and plenty of pearls for the dainty effect! Hope you enjoy your Thursday and thanks for stopping by! 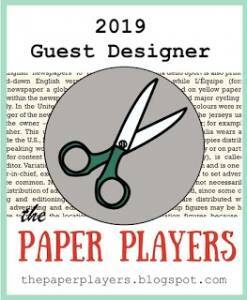 I am featuring the Irresistibly Yours Designer Series Paper (DSP) from the Sale-a-bration (SAB) catalog today! You can earn this special paper for free when you place an order of $50.00 during the SAb promotion period now through March 31st, 2015. Free is good! It has 12 sheets in the package (2 of 6 different prints). For the above card I decided to try a little spritzing with rubbing alcohol and a few drops of Calypso Coral. I sprayed several times on the 4' square piece. It does not come out really dark, which I happen to like! Below is another card from this past weekend in which I used the same paper in a different print. Here I used a sponge straight from the ink pad. I also have a video for you to watch at the link below to see the ways you can color this special paper! New Occasions and SAB Start With Butterflies!!!! Kicking off the new Catalogs today! Visit my store anytime to place an order! Love the new Occasions catty and I think you will, too! Love the many kits it offers! During the Sale-a-bration (SAB) Promotion, you can pick from several free items like stamp sets, DSP, buttons with matching ribbon! One for each $50.00 in SU! product you spend. So if you spend 200.00 like I did for pre-order, you will get 4 free items from the SAB. This promotion will run Jan. 6th thru March 31st, 2015. 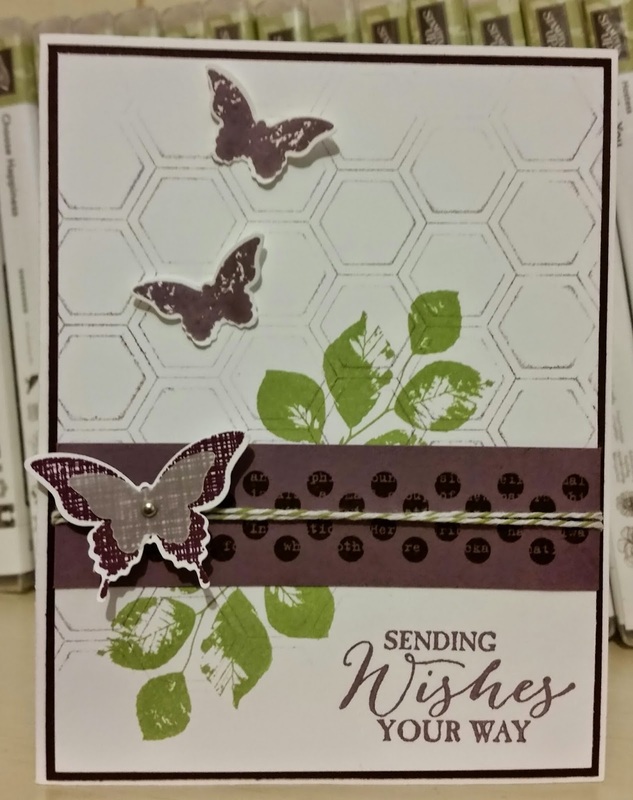 Today's card is from my favorite set in the Occasions catalog called Butterfly Basics. This stamp set is sold in wood, clear mount and photopolymer. The set can be sold with the Butterfly Thinlits dies in a bundle to save 15%! I bought this set in clear mount and I love every element in the set. The dies are so awesome as well! 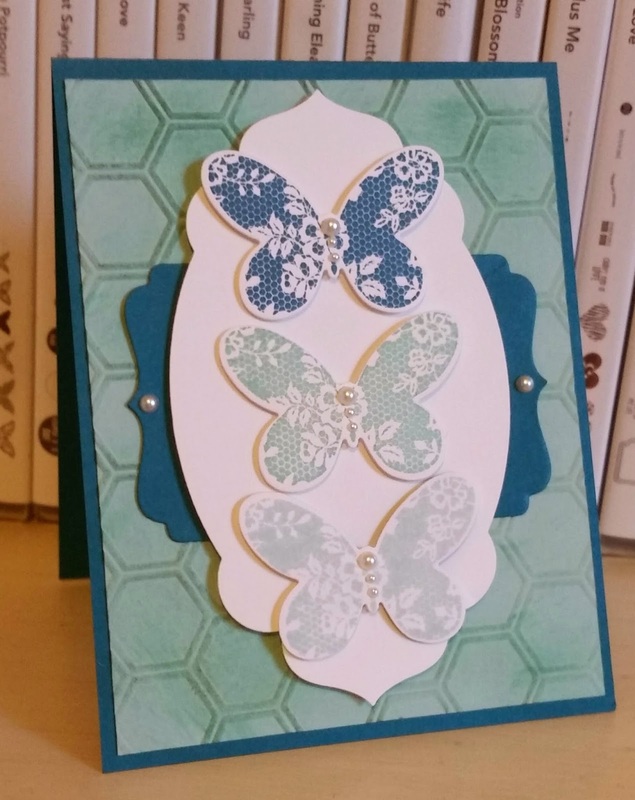 I used the small butterfly stamp and punched out with the Bitty Butterfly punch sold in the 2014-2015 Annual catalog. 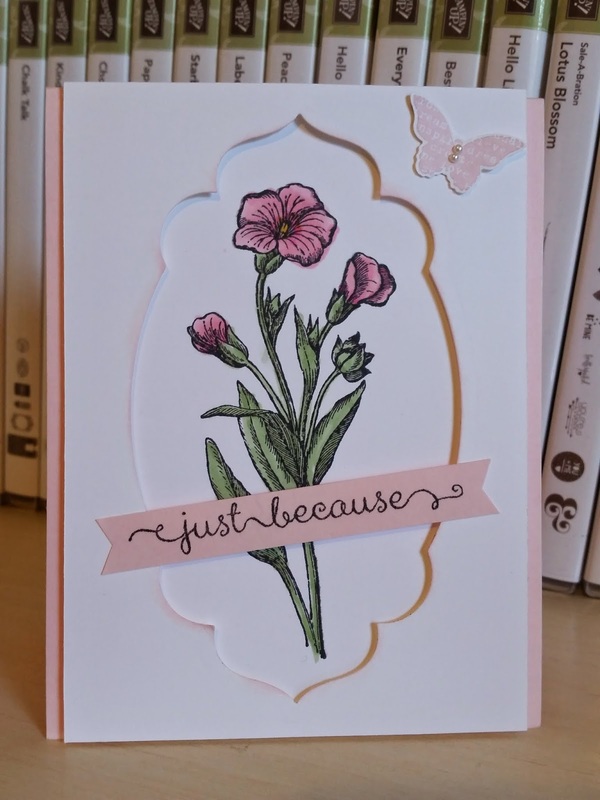 I colored my flower with blendie markers also in the new Occasions catalog in Pink Pirouette and Wild Wasabi. I had a piece of Whisper White lying on my work space where I cut out an Apothecary Accents framelits die for another project coming up on Thursday. It gave me the idea to frame the flowers and it is popped up on dimensionals over the flower. I added some shadowing with a little pink ink sponged on the inside of the cut out. 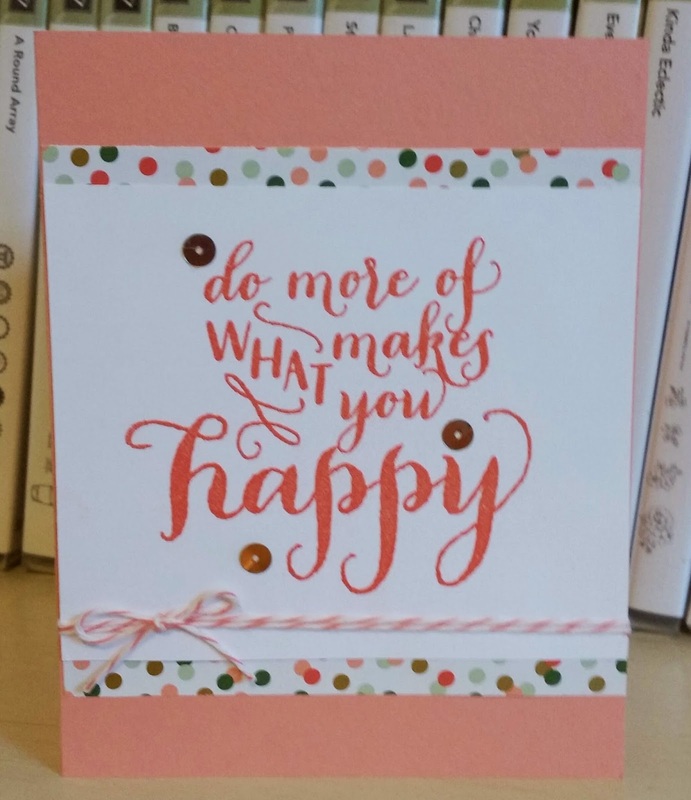 One of my favorite sentiments is this stamp from A Dozen Thoughts and I love how it fit right on a banner across this layout! Enjoy your Tuesday and happy shopping! Loads of texture here! I had this burlap in a 9" square piece on a package recently and threw it in a drawer in my craft room thinking I might be able to use it sometimes. 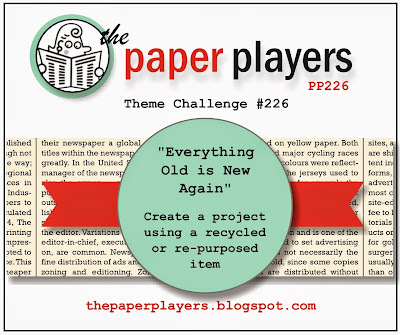 Well, when I saw the re-purpose challenge for The Paper Players, I knew what to use but not sure how I would. I wanted to stamp on it but the weave was not tight enough for an image. I then pulled out brads I have not used in a very long time and attached a 4" square to the card stock. Then I decided it had a By The Tide feel and stamped on from there! Hope your Monday is awesome! the new 2015 Occasions catalog. Those markers and this stamp set will be available this week--Jan. 6th. Thanks for stopping by and hope you have a blessed Sunday! 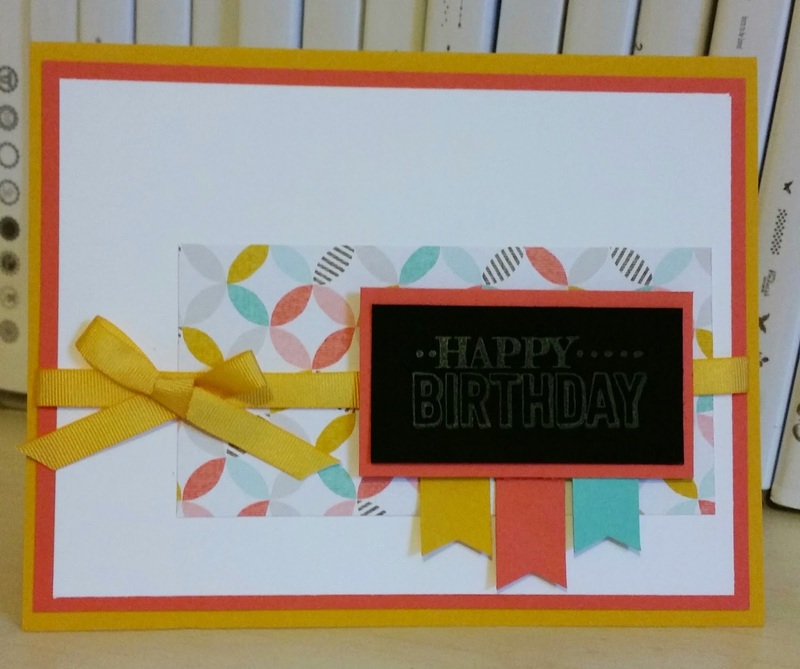 Wow, last card for January card classes! Can't believe I got all five designed in one week with a holiday and my daughter home from college invading my stamping space! Lots of blue but I do love Lost Lagoon. It is muted and a lovely watercolor type color! 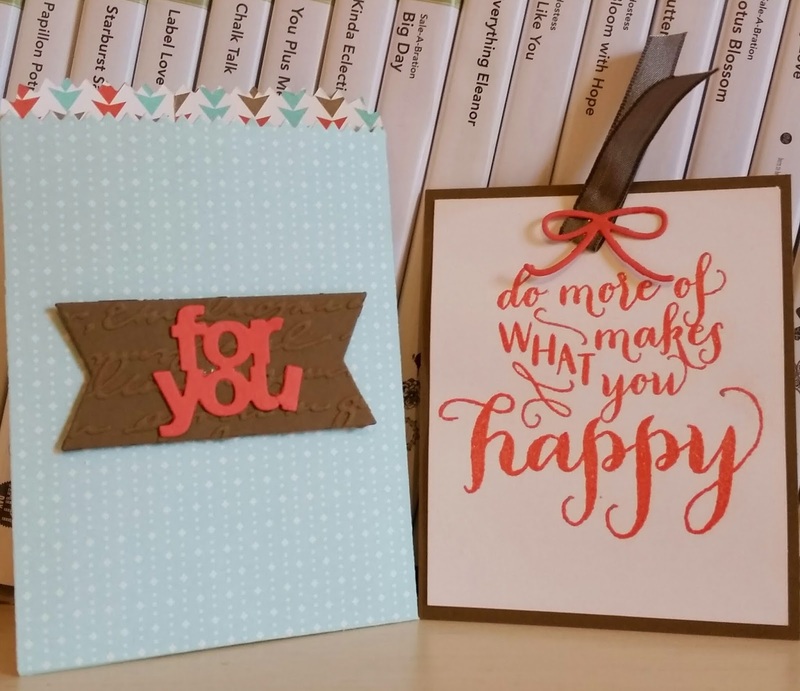 The stamp set and special Designer Series Paper are both from the SAB(sale-a-bration) catalog that starts on Tuesday Jan. 6th. For every $50 you spend on SU! product, you can choose a free item from the SAB catalog. First, the Lotus Blossom stamp set is a three step stamping set. I stamped full color Lost Lagoon with first stamp and then stamped off with same color with second stamp and last, I used the third stamp with Pool Party ink. The stem is a two step and I used Wild Wasabi...love the textured look of the stem! The specialty DSP called Irresistibly Yours comes white with embossed white images. It is meant to color either with a brayer or like me, with a sponge! I sponged Pool Party ink over the paper and I think it gave it a water colored look! I decided to stay with a neutral so added Crumb Cake with my whites and blues! Love this paper with 6 different designs! Many possibilities and hope my class loves "coloring" their DSP! Fourth card for upcoming January card classes! Love the new Chalk paper and Colorbox chalk inks...just something different! I know this layout is not exciting but I wanted the focus to be the new paper and ink which look more vibrant in person! 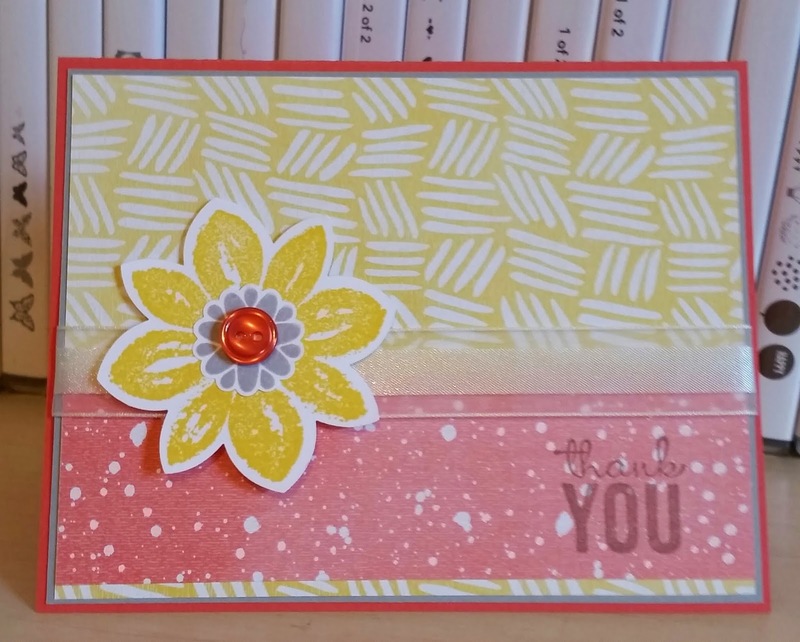 So refreshing to be playing with spring colors and getting more cards in my birthday stash! 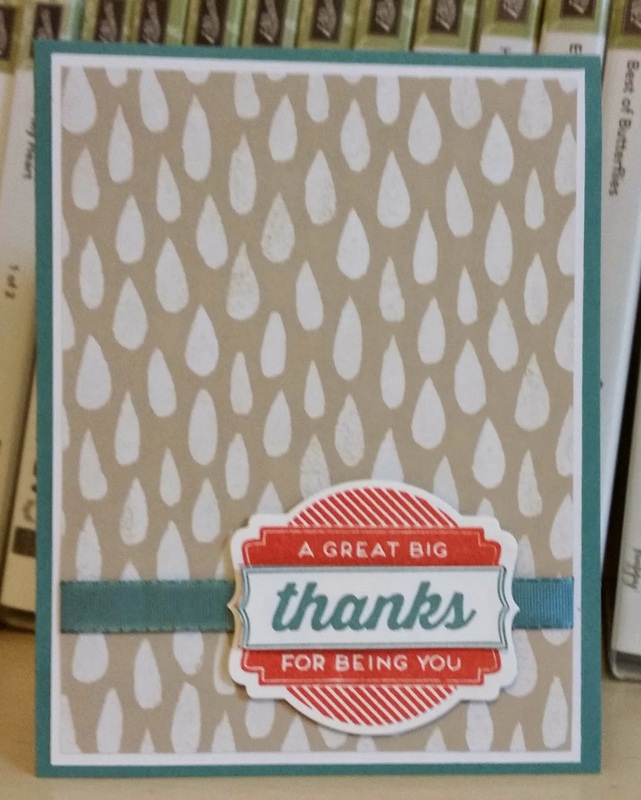 I used a stamp set called Big Day and a piece of designer series paper (DSP) called Best Year Ever. You can earn them for free with each $50.00 in Stampin' Up! product you purchase during the Sale-a-bration (SAB) sales period-Jan. 6th through March 31st. Happy Happy New Year 2015! Love this set! I think I said that yesterday! But I love playing with the Butterfly Basics set and thinlits/framelits. 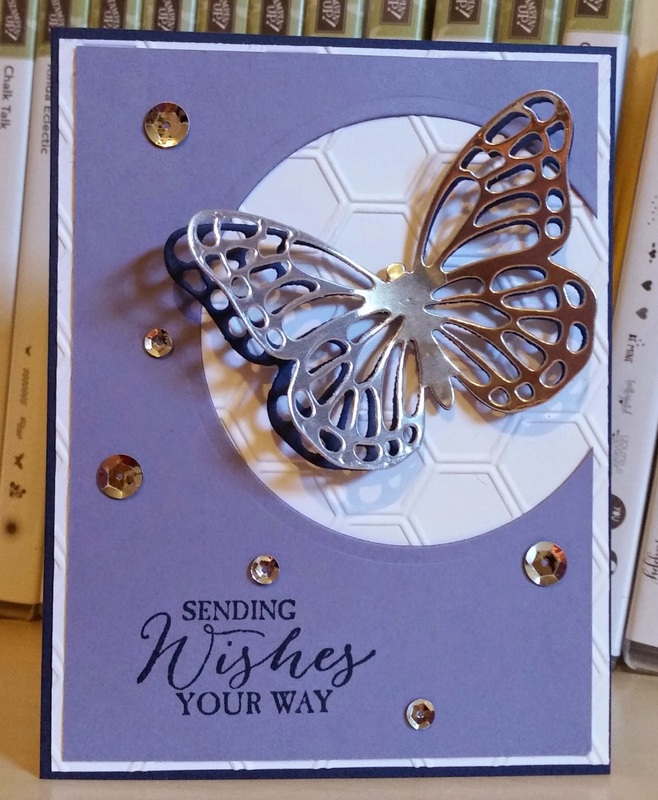 I used a sentiment from the set and then I cut out the medium size butterfly with silver foil and Night Of Navy card stock and layered for a shadow look. I did some casing from Justin Krieger at jkcardsonline.com for this layout. I knew as soon as I saw his card from his Decmeber 22nd, 2014 post that I must make one. So when saw the color combo for the challenge I decided it was my time! 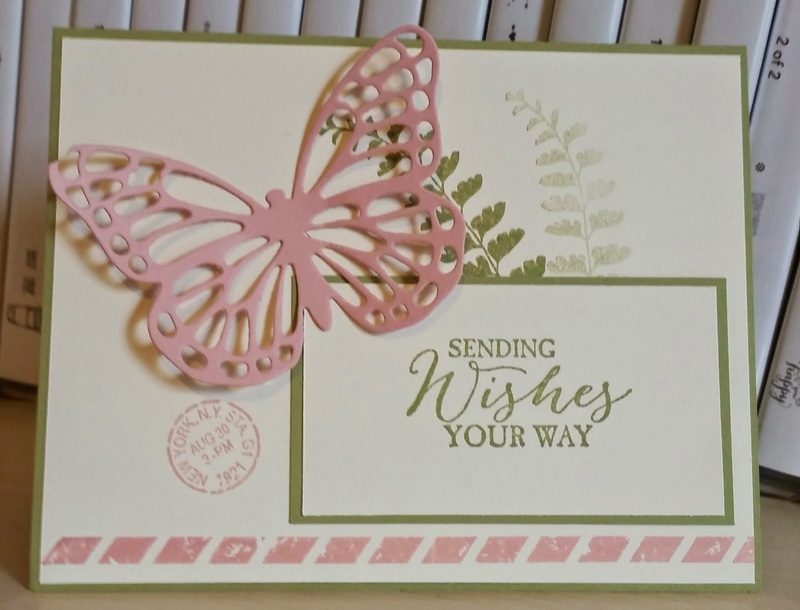 Don't forget: new product to play with coming soon....January 6th starts the new 2015 Occasions catalog which includes the Butterfly Basics stamp set and thinlits bundle! Thanks for stopping by and hope you will play along with the Pals color challenge this week!